Discussion in 'Kitchen Appliances, Cookware, Cookbooks & Recipes' started by MrsDangermouse, Apr 16, 2019 at 10:26 AM. I've been using a Tefal chefs pan for years (they call it a stirfry pan), but they don't last long: either the teflon non-stick deteriorates or the handles get a bit wobbly. I probably end up replacing them every 5 years or so.....they're my go-to pan for most things so they do get a lot of work. I've had my eye on the GreenPan ceramic non-stick pans for a while.....apart from the Tefal chefs pan, the rest of my pans are hard anodised aluminium, which I still love but they don't work on induction (and I would really like to change to induction). The GreenPan Venice Pro range seemed to fit the bill: nice looking, non-stick, and they work on all hobs, including induction. So last weekend I treated myself to a new chefs pan to replace my old Tefal one and to try out the Venice Pro range before spending lots of money on replacing the rest of my pans. The non-stick on the new pan is fabulous! I'd watched a few youtube videos of the pan demonstrating the non-stick properties before buying, and they are absolutely correct - even after cooking scrambled eggs you can just wipe the pan out with a soft cloth, no scrubbing needed. Apparently you can use metal utensils in these ceramic pans (though they recommend you don't), so far I've been using either silicone or wood. Only time will tell if it retains its non-stick, and if it will stand up to everyday cooking, but if it does then I'll definitely be replacing all my pans with this range. They aren't cheap but they're not hugely expensive either (they're much cheaper than anything from Le Creuset for example). 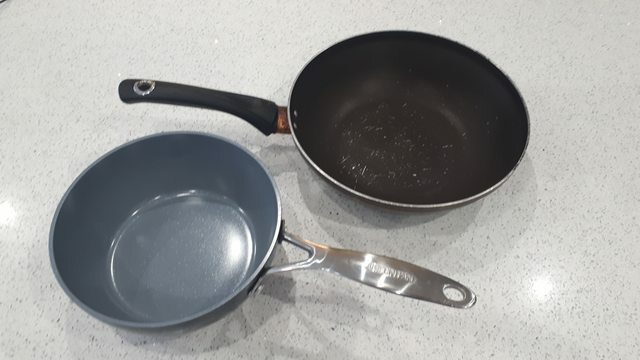 I paid £35 for the chefs pan Vs about £17 for the Tefal one, but if its durable and keeps it's non-stick then I think that's a price worth paying. Interesting - I've not seen this particular pan but have read very mixed reviews of ceramic pans and their 'non-stickness'. Yes I've read some good and some bad reviews, but the unknown factor is always the old "user error" - you just have no way of telling whether the review has used it and looked after it the way they were supposed to or not. I'm willing to give it a go (I needed to replace the Tefal pan anyway) and I'll see how it holds up after a few months. Be interesting to hear. Why do you want an induction hob? Why do you want an induction hob? A combination of aesthetics, practicality and cooking experience. I've cooked on them a few times and they are really responsive - even better than gas. For example a pan of water comes to the boil much faster on induction than on gas. From a practical point of view they are really easy to keep clean because its basically a sheet of glass and because the cooking surface itself is never hot if something boils over then it doesn't immediately stick and you can just wipe it up. And I've seen a white one which would look fab on my white worktop. I do really hate cleaning the hob....its just so fiddly with all the stands and the jets and everything. Some people worry about the running costs of induction because of course the unit price of electricity is much higher than has, but as induction is more efficient than gas they cost about the same to run. Gas wastes a lot of energy in the heat that escapes into the air around the pan whereas with induction most of the energy goes directly into the pan (that's probably one of the reason they heat up more quickly too). From a practical point of view they are really easy to keep clean because its basically a sheet of glass and because the cooking surface itself is never hot if something boils over then it doesn't immediately stick and you can just wipe it up. A ceramic hob will do the same though - I wanted to change over to that for that very reason but you need to have an oven isolator switch to get one installed apparently and I don't have one. No, with a ceramic hob the cooktop itself gets hot so if something boils over it tends to burn onto the glass. Whereas with an induction hob the cooktop is only slightly warm so even milk can be wiped up before it burns on. Induction works via magnetic fields so the pan heats up but the actual cooktop doesn't (apart from a bit of heat transfer from the pan itself). I was skeptical until I tried it, but it really does seem to be the perfect cooking technology. OK - I understand more now!